What Happens When You Add the Flavor Of DevOps To Your Tech Buffet? What Happens When You Add the Flavor Of DevOps To Your Tech Buffet? The taste buds of software developers and testers are evolving rapidly, leading to a constantly changing recipe of DevOps methodology. The organizations began with preparing a comfort meal with simple ingredients of Development and Operations. Now, as the users are demanding a luxury a-la-carte, the comfort meal has transformed into a gourmet stew, needing the rare herbs of Testing, Security, Data, AI, and what not. Since many organizations are still struggling to gulp down the DevOps soup, the ongoing modifications in the components are making it difficult for them to keep up. However, these changes have also become indispensable for metamorphosizing the dated, inadequate approach to software development to a remarkable and highly productive one. Looking at the current pace of updates in the tech industry, there are high chances of the existing software development strategies getting ambushed and obfuscated. Therefore, it is necessary to put on a clear lens and segregate fad from necessity. It took almost ten years for DevOps to extend an industry-wide reach in terms of popularity, openness, and acceptance. How long will its subsets take? Or, maybe since the initial battle has already been fought by DevOps, the journey will be rather easy for the DevOps successors. Whatever is the case, at least one thing is guaranteed – a future with intelligent, sophisticated software development life cycle with utmost efficiency and little scope for errors. The main purpose behind the introduction of DevOps was to break prevalent silos between different departments and get them to work cohesively. This was a brilliant plan and worked quite effectively for a while. As organizations started implementing DevOps, they started realizing serious gaps in the methodology. This led to the inception of DevXOps, where ‘X’ stands for anything that has been missed or left out of the DevOps strategy. At present, the most popular substitutes of X are Testing and Security, giving birth to DevTestOps and DevSecOps. Such substitutions require reform at core of the DevOps culture. DevTestOps: As opposed to the traditional step-by-step protocol of software development followed by coding, DevTestOps requires testing to be a part of the whole SDLC from start to finish. It places testers and testing in a key role and highlights their importance by offering more visibility amidst development and operation stages. 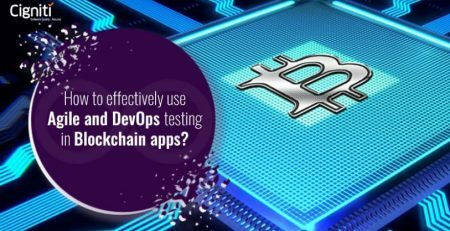 Contrary to what is generally believed, putting ‘Test’ in between ‘Dev’ and ‘Ops’ does not indicate the actual placement of testing phase in a DevOps SDLC. DevTestOps merges testing with each step of the cycle for end-to-end quality assurance. With DevTestOps, software testing becomes up-streamed and drives a Test-driven development cycle. DevSecOps: DevSecOps, also known as SecDevOps and DevOpsSec, brings the security aspect of a software development process in spotlight. By sealing any potential gaps, DevSecOps leak-proofs an application through regular monitoring and risk assessment. It activates data protection and ensures optimal compliance by analyzing written codes, modeling potential threats, and imparting required security training. DevXOps is impractical and non-feasible without automation. The promises and caliber of DevXOps or even DevOps cannot be delivered manually. It is extremely cumbersome to perform continuous testing or monitoring on a manual basis. Continuous Integration and Continuous Delivery form the essence of a DevOps strategy. If these were to be done by an individual, the process will become extremely slow and inefficient. This is where automation barges in and takes over control as the enabler of a DevOps pipeline. Not only automation prevents employee burnout but also enhances efficiency and specificity of the results produced. The need for continuous integration and continuous delivery has moved quality assurance to the extreme left and necessitated its implementation at each stage as a software development cycle moves forward. With customers influencing the organizational goals, it is also important that an open channel for continuous feedback and continuous improvement is established between the core SDLC team and the end users. By shifting right and taking user evaluation into consideration, organizations can orchestrate quick alterations and deliver actively on the user expectations. The Shift-left and Shift-right strategies have presented a new outlook of Quality Engineering in software development. Instead of simply being content with quality assurance, organizations are now taking an all-round approach with Quality Engineering. As organizations are becoming more data-driven, and as Artificial Intelligence is slowly outstretching in software development process, DataOps and AIOps will soon become the norm. Modeled on the layout of DevOps itself, DataOps and AIOps are the face of next-generation SDLCs. DataOps is a mix of DevOps, Agile, and statistical processes to streamline data analytics. By managing the data pipeline, DataOps focuses on code verification and error-free governance of data flow in operations. A fruit of Industrial Revolution 4.0 and digital transformation, AIOps utilizes machine learning and data analytics to straighten out IT operations. Keeping Big Data and Machine learning at the center, AIOps supports quick decision making and reduces the possibility of errors. The industry-wide disruption with the emergence of digital has opened the door for many more such innovations. Going by the advancements made so far, the future of DevOps and software development looks promising. However, there is an imminent need to be more embracing. 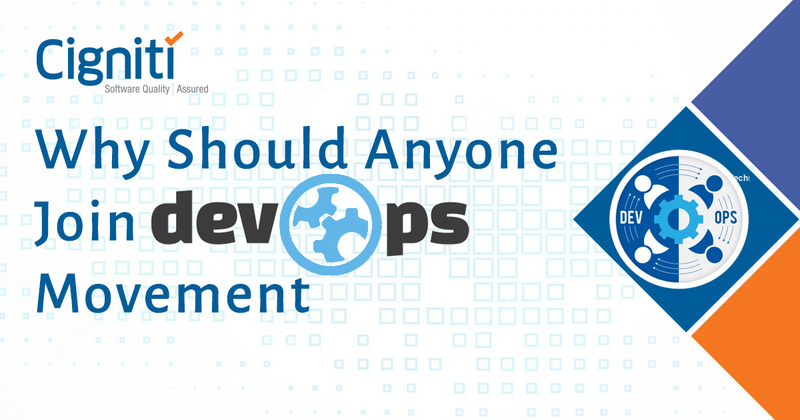 As per a recent DZone survey, only 46% of organizations have a dedicated DevOps team. This shows that there is still a long way to go. While Agile, DevOps, and automation form the base, Testing, Security, Data, and AI are the spices that flavor the dish. Like DevOps, they are also people-driven rather than process-driven. Therefore, it is imperative that change is managed effectively, and proactive measures are taken to build the desired culture. At Cigniti, we standardize efforts and ensure accelerated time to market with DevOps Testing. We also focus on delivering improved deployment quality and greater operational efficiency. Cigniti’s CI testing experts boast of a rich experience in Continuous Integration testing and can configure and execute popular CI tools such as Agile GO, Cruise Control, Chef, Puppet, Microsoft TFS, Jenkins, Bamboo, Hudson and so on, helping client’s DevOps teams. 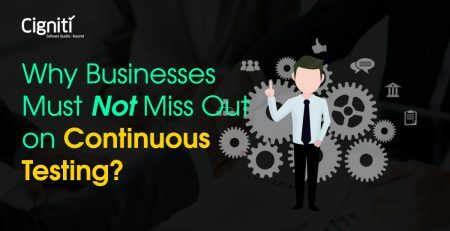 Why Businesses Must Not Miss Out on Continuous Testing?